Most daguerreotype portraits were what I will call "private" portraits: portraits taken for a fee, and intended as keepsakes for the customer and his or her loved ones. Alan Trachtenberg calls these portraits "memorial" portraits,(1) a term I have avoided because of possible confusion with the mourning portraits in the next chapter. But it is a good word, if taken in its most literal sense. In contrast to public, "emulatory" portraits of famous people,(2) or to documentary photography, these photographs were almost always taken of someone the viewer already knew well. The daguerreotype enhanced memory, evoking the deepest essence of an already familiar subject. Estimates of either the total number of daguerreotypes taken or the number extant are unreliable, but we can safely guess that the former figure is in the tens of millions, and the latter is certainly in the millions. The New York Daily Tribune estimated in 1853 that three million daguerreotypes were being made annually. (3) Of these, most were private portraits. The price of a daguerreotype, at the height of its popularity in the early 1850's, ranged from 25 cents for a sixteenth plate (of 1 5/8 inches by 1 3/8 inches) to 50 cents for a low-quality "picture factory" likeness to $2 for a medium-sized portrait at Matthew Brady's Broadway studio. (5) Fifty cents, probably the most common price paid, is roughly $8.75 in 1991 dollars(6): not an extravagant purchase for the middle class. The daguerreotypist found eager customers every where he went; the daguerreotype portrait was a deeply valued addition to the conventional middle-class home. In a certain way, the photograph approached reality. It helped the viewer to recreate the memory of a loved one and allowed deep reflection on his or her character -- it made it seem, in short, as if the subject was there when he or she was not. This idea was expressed explicitly in a few daguerreotypes, like the one in Figure 2. 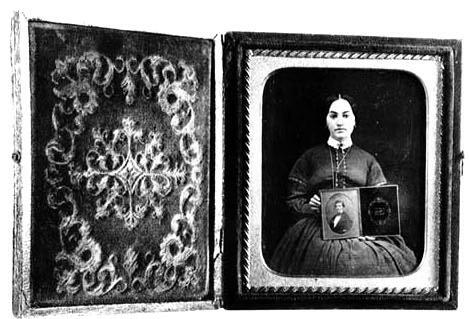 The daguerreotype, reproduced here with its case, is a simple portrait of a woman, except that she is displaying a portrait of a man, presumably her husband, in a similar case. The larger photograph serves to depict the function of the smaller: the representation, and through it, the memory, the presence of an absent person. The great irony of the private daguerreotype portrait is that the daguerreotype, with its reputation for accuracy and the ability to evoke the essence of man or woman, was intensely constructed. In other words, mid-century men and women did not simply sit back and let the camera absorb reality; they gave it a posed, constructed reality to absorb. Of course, some level of construction was unavoidable -- the technical limitations of the daguerreotype made "candid" shots impossible. (9) As we will see in this and the next two chapters, however, the subjects of daguerreotype portraits, with the help of their photographers, represented themselves in very specific ways: as they saw themselves, or as they wanted to be seen. The most ubiquitous expression of the impulse to mark class in the daguerreotype was clothing. 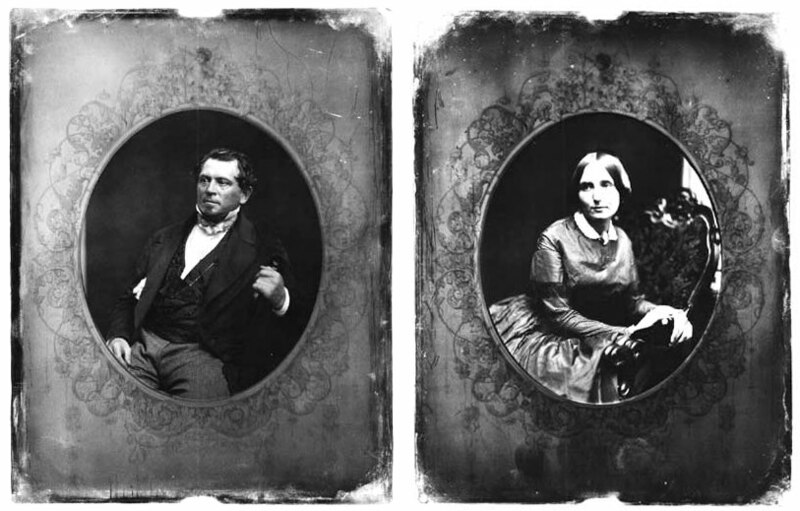 Virtually no examples of daguerreotype portraits, excluding the occupational photographs discussed in Chapter Four, show anyone who is not in their "Sunday best": for men, the dark suits that were rapidly becoming the uniform of the middle class, and for women, a mix of similarly somber garb, as in Figure 2, and lighter, willowy, "sentimental" dresses. (11) The daguerreotype, with its ability to expand the moment of the portrait into broad, social time, inflated the temporary class marker into a permanent one, telling the viewer that the subject always dressed with upright gentility. The private portrait also used the conventions of the middle-class parlor to establish gentility, and to emphasize the domesticity of the middle-class, the separation of the civility of their class from the coarseness of the workplace and the market. These conventions were used especially for women, though they can often be found in men's portraits as well. In contrast to women's portraits, men's portraits are sometimes of the head and shoulders only, as if to allow for the fluidity of their role, their daily shift from business to home. 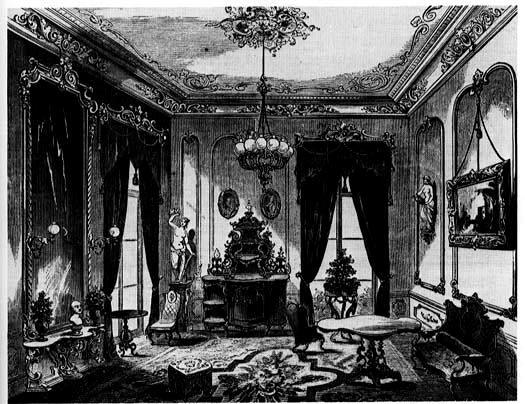 Most daguerreotype studios had a ready supply of carpets, tables, and armchairs to create the illusion that a portrait was taken in the parlor. The temporary studios of the itinerant daguerreotypists were not as well-stocked, of course, but often included a table covered with a plush (but portable) table cloth. The Southworth and Hawes daguerreotype of Boston shipbuilder Donald McKay (Figure 4) was certainly not taken in a real parlor -- one of the trademark columns of the Southworth and Hawes studio can be seen at the far right -- but it creates a middle-class space nevertheless. McKay is sitting in the standard man's armchair, and his arm rests on a barely visible parlor table. In subtle contrast, the Southworth and Hawes photograph of an unidentified woman in Figure 5 has a smaller, armless chair but emphasizes the parlor table, and through it, her connection with the domestic space. Indeed, the book on the table suggests that she has been doing something -- reading -- in the parlor, while McKay's portrait is more removed (it does not directly represent a slice of domestic life). While the woman's portrait serves more explicitly to create social time (or to put it another way, an impression that we have visited her during her normal day), both portraits designate the middle-class social space of their subjects. The added irony of these constructed conventions is that they were, in the daguerreotype portrait, so easily constructed: the parlor surroundings of a daguerreotype portrait were always fake, more or less, and the clothes could have been borrowed, or at least atypical. Even the lives they represented were becoming more and more attainable to the working classes, as mass-production lowered the cost of "fancy" clothes and furniture. (13) It was becoming easier and easier to fake gentility, or to be genteel -- the line between the two, in fact, was becoming blurry. It was, perhaps, the paradox inherent in these class conventions that drove the intensity of their representations. 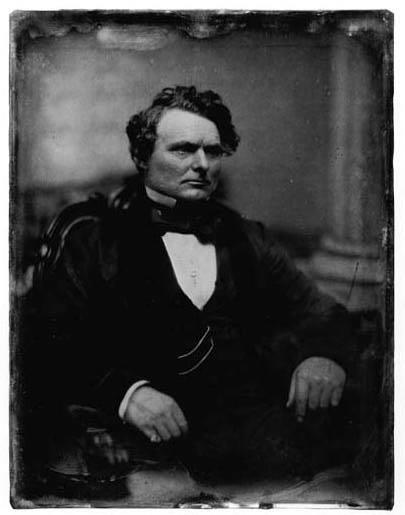 Class markers were not the only markers employed in the daguerreotype portrait, and class was not the only social category that was designated by the daguerreotype (we will discuss markers of mourning in the next chapter, and markers of occupation in chapter four). 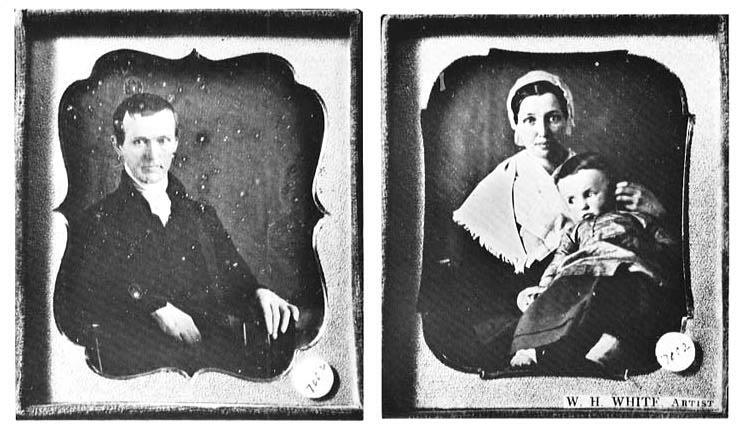 Often, as we might expect, daguerreotypes were used to represent the family; to construct a picture of the relationships between family members. Familial social space was created, sometimes, not by one photograph, but by two. Husband and wife often had similar portraits taken, to be put in matching cases and to be displayed together. See, for example, the portraits of a man and his wife by Southworth and Hawes in Figure 6. The idea of the marriage is expressed physically, by the matching cases, by the identical gazes. The domestic role of the woman is expressed by the dominance of the chair in her portrait and the presence of the light behind her -- which comes, in fact, from a column, but gives the impression that she is in front of a window in a room. Like the first plate in this chapter, these portraits show the ability of the daguerreotype to create presence. In this case the effect is more complicated; even if no person is present, the two portraits are together, symbolizing the union of the couple in the absence of both. The marriage portraits in Figure 7 add another element: a child. The categories of this dual marriage portrait are, instead of husband and wife, man and family. While there are very rare portraits of a man with his wife and children, most representations of the family were accomplished in this way. This dual system emphasized the domestic role of the woman, and allowed the man to retain a certain autonomy -- his portrait could be viewed alone -- with his family as an attached, but not essential, unit. Convention, apparently, did not allow for portraits of father and child. A few portraits of entire families exist, but these were rare, in part because of the increased chance that someone would move and blur the picture. Furthermore, as we will discuss in chapter three, fathers were often photographed mourning their dead children. Otherwise, fathers and children were not photographed alone together -- convention required that the mother serve in some intervening role. The daguerreotype portrait acted as a delineation of and, it could be argued, as a transmitter for middle-class values -- for ideas of class, gender, family and childhood. At a time when the American middle class was forming, and forming a set of beliefs and conventions for living, the daguerreotype amplified those conventions, telling the world that the subjects were properly "respectable" and thoroughly middle-class. In the process, those conventions were inscribed more deeply; once a convention was daguerreotyped, it seemed all the more permanent and important. 1. Trachtenberg, Reading, p. 30. 2. Trachtenberg, Reading, p. 33. 3. Robert Taft, Photography and the American Scene (New York: Macmillian, 1938), p. 63. 4. Trachtenberg, Reading, p. 30. 5. 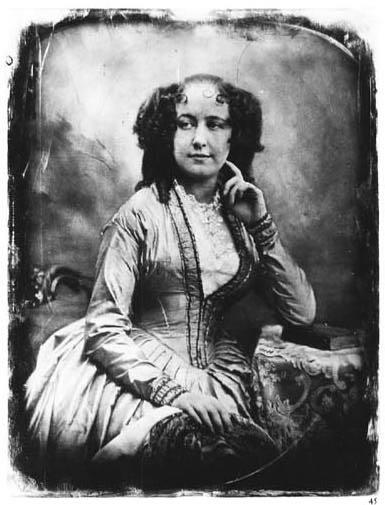 Newhall, Daguerreotype, p. 63. Newhall also notes that Brady began offering cheaper, more efficiently made portraits in 1853 (in addition to the $2 version, presumably) in response to the competition from "picture factories." 6. See John J. McCusker, How Much Is That in Real Money? A Historical Price Index for Use as a Deflator of Money Values in the Economy of the United States (Worcestor: American Antiquarian Society, 1992). Neither this estimate nor the estimate of prices is entirely reliable, but they will provide the reader with a general sense of the cost of the daguerreotype and the significance of its purchase. 7. 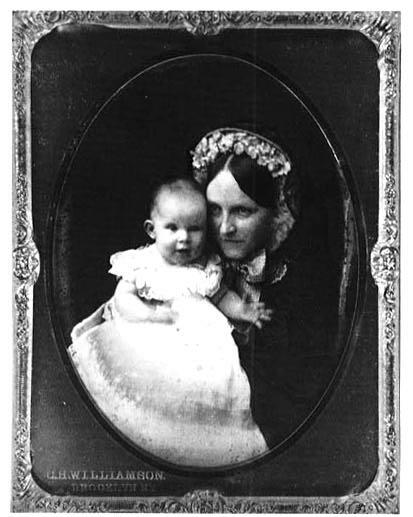 Newhall, Daguerreotype, p. 55. 8. Newhall, Daguerreotype, pp. 67-75. 9. If spontaneous photographs are "candid," one might ask, what are posed pictures? Deceitful? 10. John F. Kasson, Rudeness and Civility; Manners in Nineteenth-Century America (New York: Hill and Wang, 1990) and Karen Haltunnen, Confidence Men and Painted Women; A Study of Middle-class Culture in America, 1830-1870 (New Haven: Yale University Press, 1982). 11. See Kasson, Manners, pp. 119-121 and Haltunnen, Confidence, pp. 75-79. "Sentimental" dress became fashionable for urban middle-class women in 1836. It was part of a larger cultural movement that emphasized intense feeling and calculated sincerity for women, in reaction to the cold hypocrisy of the marketplace. 12. Kasson, Manners, pp. 174-175. 13. See Stuart M. Blumin, The emergence of the middle class; social experience in the American City, 1760-1900 (New York: Cambridge, 1989), pp. 140-163. 14. For similar examples, see Shimshak, Power, plate 35, Newhall,Daguerreotype, plates 14 and 43, and Sobieszek, Spirit, plates 59 and 63. 15. 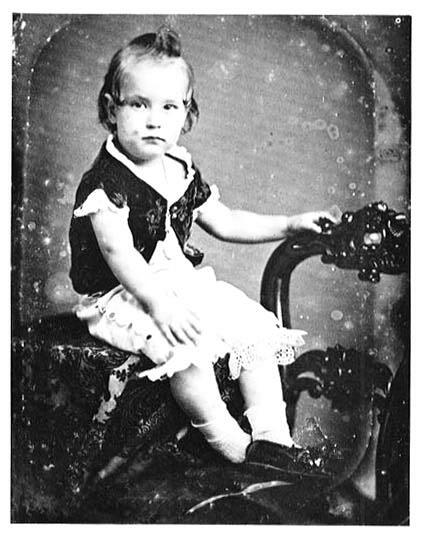 Sentimental child portraits can be divided, roughly, into two groups: the first includes children standing next to adult-sized tables or chairs to emphasize their smallness (See Sobieszek, Spirit, plates 49 and 55, Rudisill, Mirror, plate 176, and Wood, America, plate 18 and 20); the other includes children (often sleeping or feigning sleep) with child-sized furniture (See Wood, America, plates 25 and 31, and Sobieszek, Spirit, plates 50 and 54).